This week’s AquaNerd Picture of the Week is going to be slightly different. Instead of telling you all about the critter in the photo, we’re leaving it a mystery and letting you guess what it is. 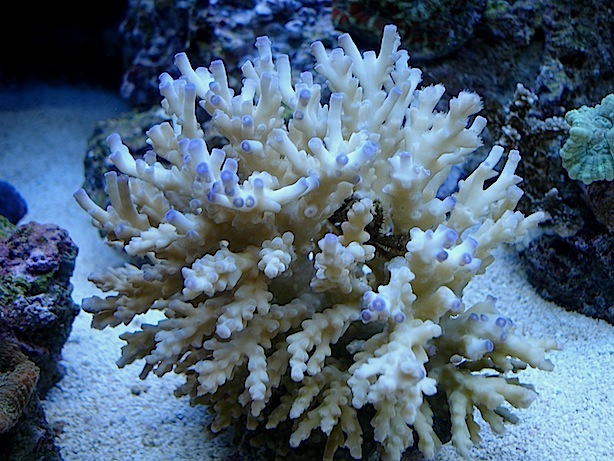 Inside the blue tipped Acropora colony resides a hitch hiker. It stays buried in the branch of the coral, occassionally coming out when food is placed into the aquarium, and even though it looks rather scary and ominous, it’s really a beneficial organism. Can you find this hitch hiker? If so, feel free to chime in below in the comments section with your guess as to what it might be. Once the correct answer has been posted, we’ll write a little more about these fascinating creatures. It looks like a Ruby Red Emerald Crab, I had one of them come on some of my live rock.